Surfing is practically a national pastime in Australia. The trouble is, the waves aren’t always breaking and Australian surfers can’t survive for very long without some sort of board sport to indulge in. Since snowboarding is out during the summer months, those who are lucky enough to live in a place that has big “waves” of sand that “break” all year around go sand surfing, or sandboarding as it is better known. Thanks to the Australian entrepreneurial spirit, sandboarding isn’t limited to those few who happen to own a dune buggy, 4WD or dirt bike. If you want to “have a go,” you can rent a board and a buggy or go on a group excursion to some of the biggest sand waves in Australia yourself. If you’re not a stand up surfer, that’s not a problem, either: sand toboggans can be arranged. If you’re a shredder, you can try a beginner’s sandboard first, just to get your feet “wet” and then switch to a high performance board. Kallgari is located on the west coast, about 370 miles (600 kilometers) north of Perth. This is one of the most unspoiled, unpopulated areas of Australia outside of the uninhabitable parts of the outback. Your adventure will start at the small town of Kallgari, where a comfortable 4WD vehicle will take you and your crew out to the dunes. Afterwards, you’ll cool off with a swim and snorkel session in Lucky Lagoon. A little closer to Perth (about 75 miles away), but still far away enough for a great adventure is the little fishing town of Lancelin. A massive sand dune system virtually surrounds the town and has some of the steepest dunes you’ll find anywhere in the world. From your takeoff point at the top of a dune, you’ll get a bird’s eye view of the township, the countryside and the glittering Indian Ocean. Then you’ll plummet to the base of the dune, only to make the climb back up to do it all over again before heading for the beach to cool off. Kangaroo Island in South Australia is a must-see destination if you love wildlife and unspoiled nature. As popular as the island is, it is meticulously maintained by the locals, who want it to remain unspoiled forever. 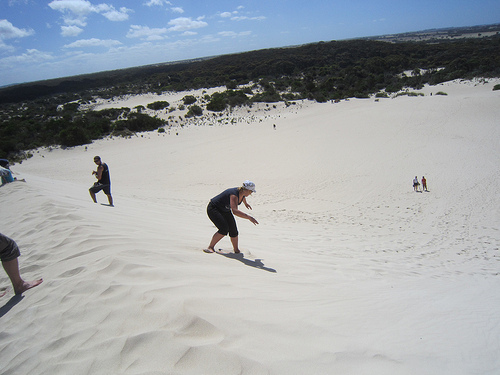 Kangaroo Island also happens to be home to an enormous inland sand dune system called Little Sahara. The best way to get to the slopes is by a quad bike, which you can rent along with your high performance sandboard. While the slopes may not be as “rad” as those in WA, Kangaroo Island will blow you away and your day of sandboarding will just be the icing on the cake. If you’re on the east coast of Australia, don’t worry. 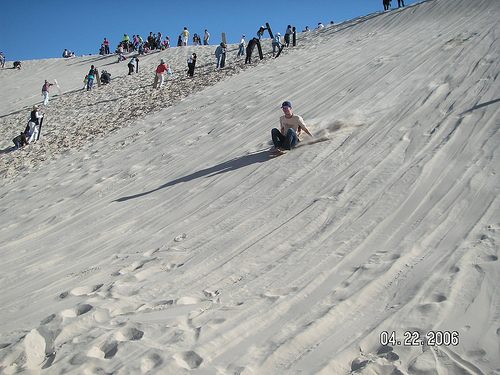 You can use sandboarding as your excuse to get out of Sydney and explore the Great Lakes region and Port Stephens. The Stockton Bight sand dunes are nothing short of awesome and include some of the longest slopes you’ll find anywhere in Australia. Rides of up to 150 or more are easy to find, but keep in mind that you’ll be hiking to the top again when the ride is over. Access is via 4WD and everything is provided. A great way to “surf” the Stockton Bight dunes is to include it in a full day adventure tour of the region that includes time for a swim in the Tasman Sea. Rob enjoys the great activities available around Australia. To experience some of these activities yourself find one of the many accommodation Sydney options available on our website as a starting point to your vacation in Australia. This entry was posted in Australia, Bizarre, Sand Boarding, Travel and tagged Australia, Sand Boarding, Sand Surfing, Sandboarding. Bookmark the permalink.